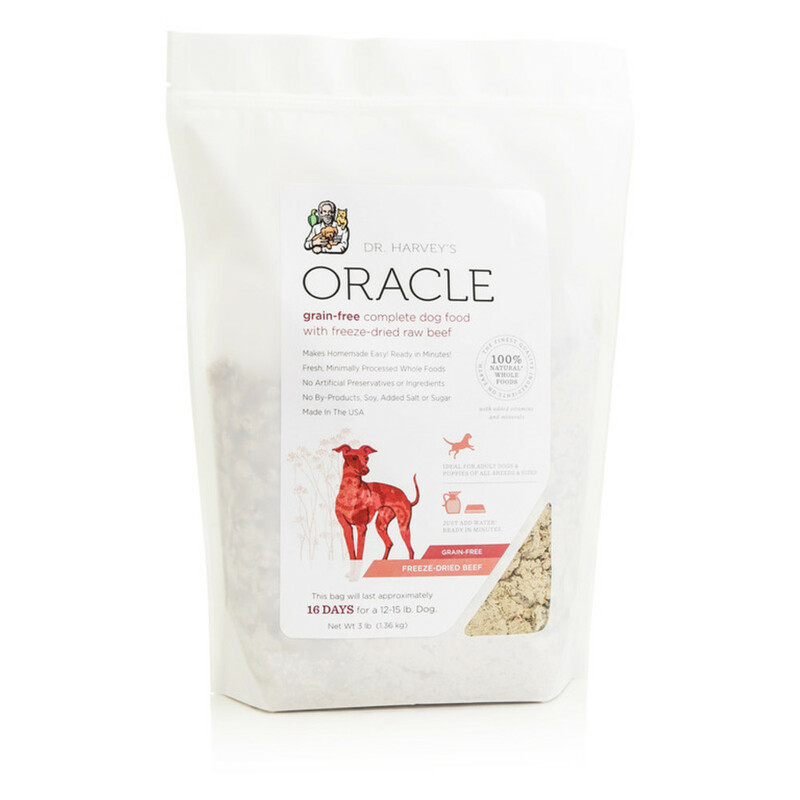 Want to Try Oracle Grain-Free? Just pay Shipping & Handling. Find Dr. Harvey's at more than 426 stores. Enter your zip code below. Buy Dr. Harvey's from your favorite and trusted online stores. 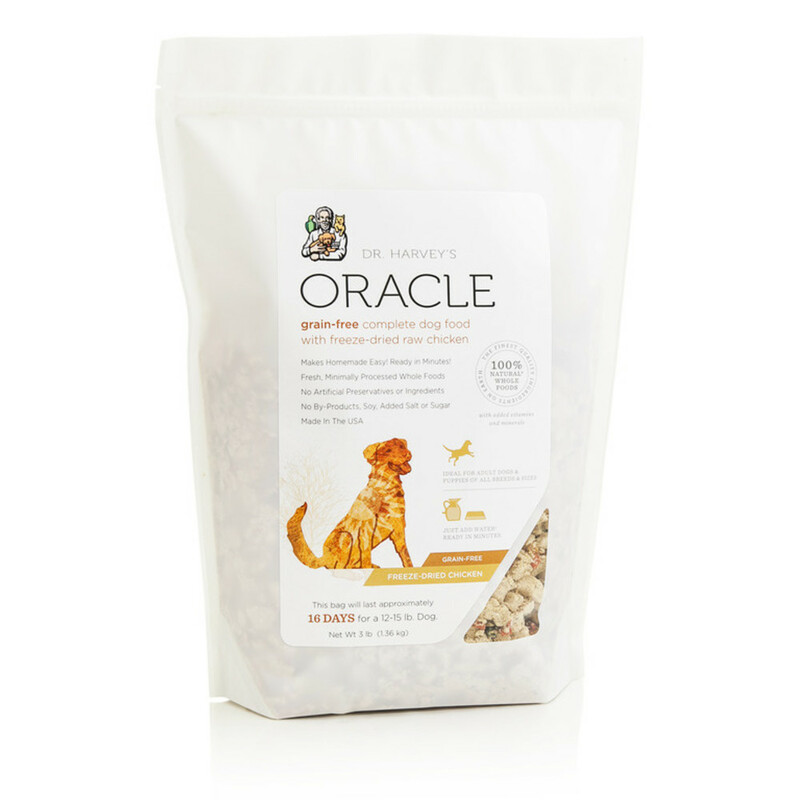 Oracle: The Complete & Balanced Dog Food – Now With Fruit! 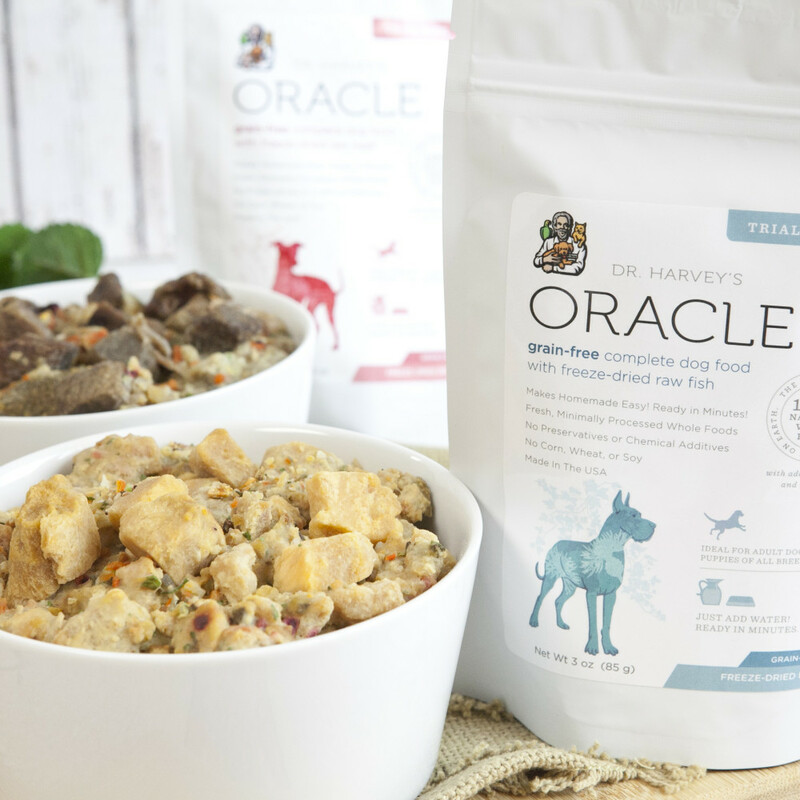 Dr. Harvey’s Oracle is a complete “just add water” dog food made with an ideal blend of fresh high quality meat, vegetables, fruits (NEW! ), vitamins, minerals, and other essential nutrients. It’s all ideal for supporting the development and maintenance of healthy skin, bones, eyesight, digestion, kidney functioning and more! Meat is Ingredient #1. You won’t have to search the ingredients for Oracle’s meat content, because it’s #1 on the list. What’s more, the protein is fresh, regional USDA beef, chicken or fish. It’s REAL MEAT that dogs need, and there’s absolutely no soy. Fresh Veggies & Fruits. Each bag of Oracle is loaded with ultra-nutritious vegetables and (NEW!) fruits. It’s the most bio-diverse dog food available, exceeds AAFCO Standards, and is ideal for dogs at every life stage: from pups to seniors. From our kitchen to yours. Oracle contains absolutely no chemicals, preservatives, additives, fillers or by-products. There’s also no salt, sugar or wheat. We only use hand-picked human-grade ingredients, and Oracle is proudly made in the USA. 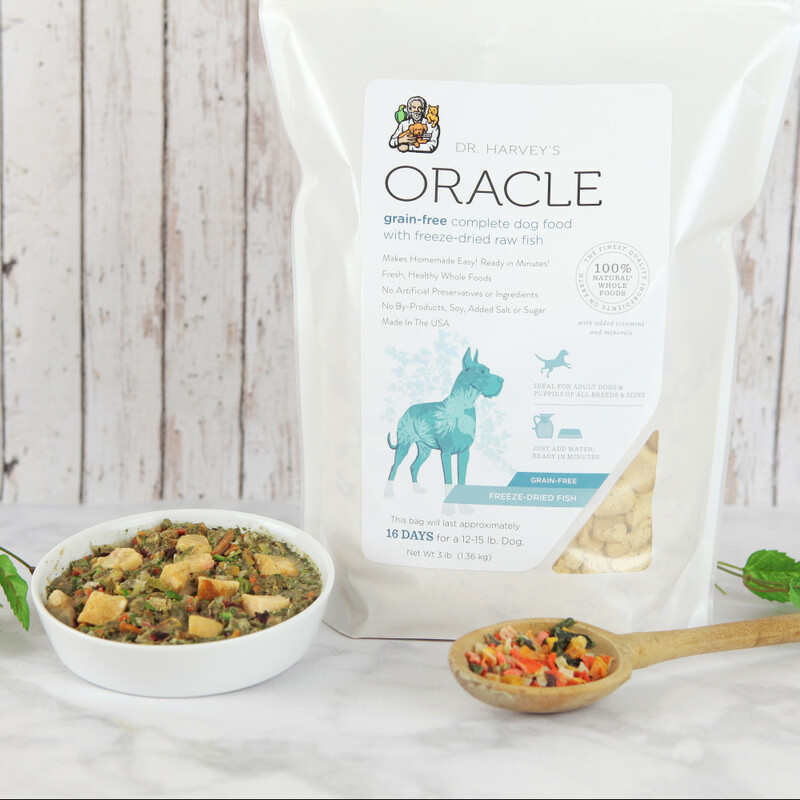 Simply put, you’ll love how healthy and nutritious Oracle is, and your best friend will love the mouth-watering taste at mealtime! Each bag of Oracle now contains a different blend of wonder fruits, such as banana, apple, cranberry, blueberry and coconut. These fruits are extremely healthy for dogs, and deliver essential fiber, vitamins, enzymes and antioxidants with every meal. Adding fruit to a dog’s daily diet has been shown to help fight off disease and boost energy levels, as well as support muscle growth, heart health and metabolism. And now as the Oracle story continues, we’ve added fruit to the formula, including apple, banana, blueberry, pumpkin and coconut! While dogs are natural carnivores, leading veterinarians and holistic pet food experts agree that dogs greatly benefit from a diet rich in both vegetables and fruits. 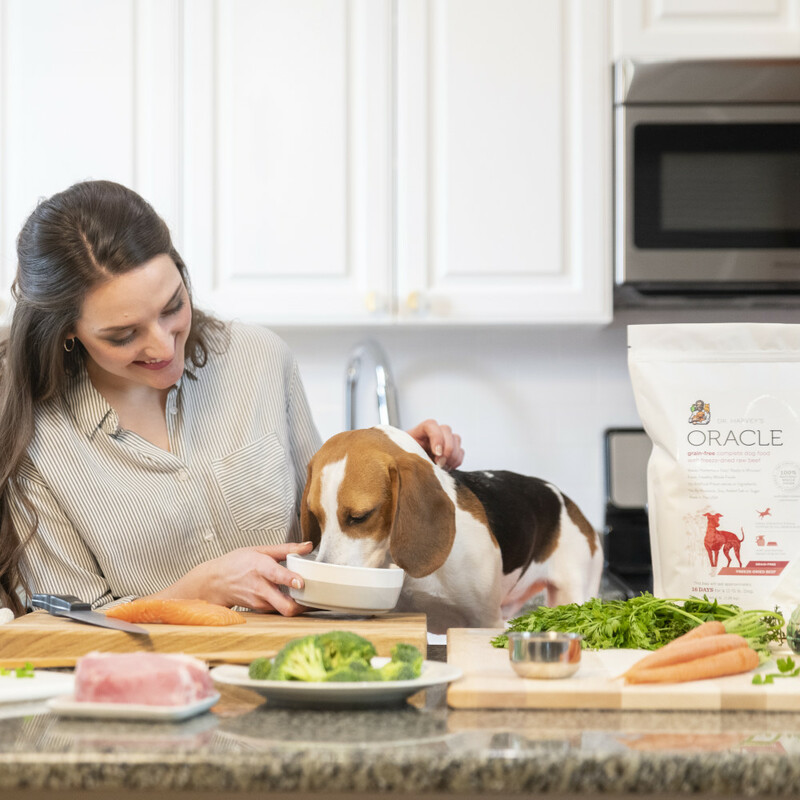 Step 1 – Add Oracle to your dog’s bowl. Shake the bag to distribute food evenly. Measure the appropriate amount of dry food (see the adjacent feeding chart) and add it to your dog’s bowl. Feeding amounts are only general guidelines. Individual requirements will vary depending upon factors such as metabolism, daily activity, breed, health, genetics, and environment. Step 2 – Add hot water to Oracle. Measure the appropriate amount of hot water (see adjacent chart) and add it to the dry food. Let sit for 10-15 minutes or until the food has absorbed the water and has the consistency of oatmeal. You can add more or less water to change the consistency depending on your dog’s preference. Step 3 – Watch a happy and healthy dog eat. Serve at room temperature. Always make sure your companion dog has fresh, clean water to drink. The following amounts are only general guidelines. Individual requirements will vary depending upon factors such as metabolism, daily activity, breed, health, genetics, and environment. You are the one that actually knows your dog, so you are in the best position to fine tune this general guideline. Part of healthy feeding is monitoring your pup’s weight. If your dog is too thin, feed more than the suggested amount. If your dog is overweight, feed less. When in doubt, remember that it’s better to feed a little less than to overfeed your companion dog. At Dr. Harvey’s, we’re dedicated to maintaining the highest standards of food safety and nutritional integrity – which is why you won’t find any preservatives, dyes, wheat, soy, sugar, salt or artificial ingredients of any kind in Oracle. To learn more about our commitment to natural, safe and 100% chemical-free ingredients and products, click here. Contains minimum 28 percent crude protein, minimum 13 percent crude fat, maximum 5 percent crude fiber, maximum 9 percent moisture. Contains minimum 27 percent crude protein, minimum 12 percent crude fat, maximum 6 percent crude fiber, maximum 9 percent moisture. 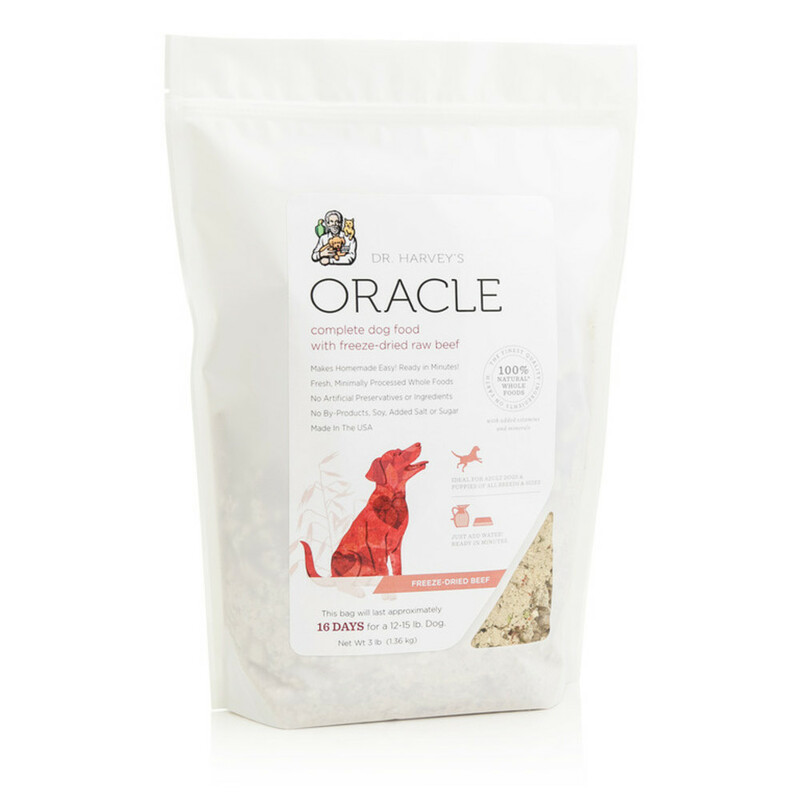 We proudly stand behind Oracle and believe that it’s the best food available for improving your dogs overall health and wellness. If for any reason you (or your beloved companion!) aren’t satisfied, let us know and we’ll refund your money.